How is my work comp check calculated? Today’s topic is to review how the compensation rate is calculated. It all starts with the Average Weekly Wage (AWW). The average weekly wage is based on an average of gross income earned in the 13 weeks preceding the accident, not counting the week in which the accident occurred. “Second job” wages may be included so long as taxes were paid on that income and the worker was a covered employee for workers’ compensation at the second job. Special rules apply when the injured worker was not employed for a full 13 weeks preceding the accident. Sometimes a similar employee’s wages are used. If there are no similar employees, sometimes the “contract of hire” is used where the hourly rate is multiplied by the hours the employee typically worked. In my experience, insurance companies will use whatever method saves them money and pays you less. If you have any doubt as to the accuracy of your AWW, please contact me for a free consultation. In our next post, we will discuss when Temporary Total Disability benefits (TTD) are paid and how they are calculated. We understand how an on-the-job injury can impact your life. "Frank did an excellent job with my workers comp case. His staff is awesome as well. Highly recommend him to anyone looking for a great Lawyer with a work comp case. Very positive outcome and very happy with results." "I just want to thank you guys for making a difference in peoples’ lives, whom may not be able to speak for themselves." 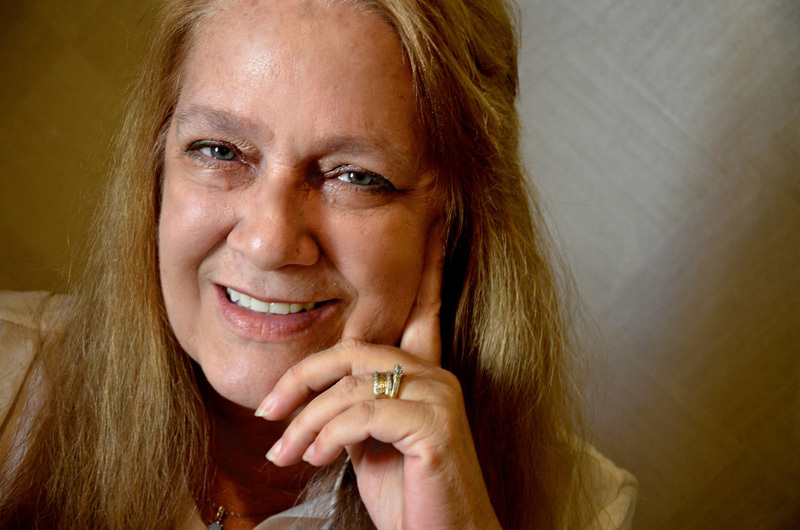 "Coral always returned my calls and was extremely pleasant to talk to. They make their clients feel sure that they have the client’s best interests at heart. That is what Mr. Piazza and his staff did for me." "Attorney Piazza spent more than an hour explaining everything about this case to me, from all perspectives. He presented as one of the most professional, knowledgeable attorneys I have had the good fortune to meet." "I am very happy with everything. I’m so glad Frank and his wonderful staff took over my case. From that point on my questions and concerns were taken care of promptly." "After I previously worked with 2 other failed Attorneys, I was lucky enough to find Mr. Frank Piazza who handled my workers compensation case wonderfully. I was amazed by his knowledge, confidence, and attention to the details of the case. His office staff was phenomenal." "I would recommend Mr. Piazza and his Naples staff. They made all the difference in this case for me. He took the time to explain, answer, and address all of my questions and concerns." "Mr. Piazza is a good listener and explains everything well." "Mr. Piazza handled my husband’s Workers Compensation case like he was a friend. He was very professional. I trust him and will definitely recommend him." "My experience with Mr. Piazza was great. I am very happy with the outcome of my case and settlement. I am very grateful for Mr. Piazza and his staff for the terrific service I received and I will definitely recommend Mr. Piazza at 100%." "They were patient, compassionate, understanding, and professional in each and every contact I had with them, whether by phone, fax, or in person. I will be eternally appreciative of Frank and his competent associates." "Very professional and helpful. Thanks again for your help." "Frank and Coral did an amazing job on my case! They were both on top of everything throughout the whole process. I would recommend them to anybody and if needed be I would go back to them again." "Throughout the entire ordeal, Frank and his exceptional staff supported, encouraged, and gave me hope that one day my life might return to "normal"." "Frank Piazza's formula of personal service, knowledge of the complex subject matter, and attention to detail assured the best possible outcome for my case. Words cannot convey my feelings of gratitude to Frank and his staff for the outstanding service I received as their client. They are excellent examples of what is right in our legal system today." "One of the most professional and courteous offices I have dealt with as an adult. Thank you!" "I learned a great deal from him, and I thoroughly appreciated his generosity with his time. I would recommend attorney Piazza without reservation." "Your office has taken care of my workers compensation case and I compliment your entire staff. I want to thank you and your staff for your professionalism as you all were exceptional and the primary factors in my case being completed to my satisfaction." "Just keep up the great work. I would and will recommend anybody that needs a workers’ compensation lawyer. Thank you for all the help, Mr. Frank." "Thank you for all your support and your help. It was always a pleasure talking to the secretaries on the phone. God bless you, always. Thank you, again." "I would recommend them to everyone I know if they needed help with a case." "Mr. Piazza, I appreciate you personally take care of my requests in a timely manner. If not within your control, you or one of your associates would reach out to me promptly, giving me a complete and satisfactory explanation of the situation." Coral lived in Madrid, Spain for 4 years, and studied Spanish while there. Coral is both fluent and literate in Spanish, which is of great service to Spanish-speaking clients. Should you or a loved one require our services please contact us. Outcome: We won. The judge ordered that workers compensation authorize a cardiac bypass surgery for our client. Outcome: We won. The judge ruled that workers' compensation must authorize a psychiatrist for our client. Outcome: We won. The judge ordered that workers’ compensation authorize a cardiac catheterization procedure for our client. Outcome: We won. Workers’ compensation was ordered to authorize neurological treatment for our client’s neck and left arm injuries. Outcome: We won. The judge of Compensation Claims ordered workers’ compensation to authorize a facet rhizotomy procedure. Outcome: We won. Compensability of the workers’ compensation claim was awarded, as were various medical and compensation benefits. Outcome: We won. Workers’ compensation checks were awarded to our client. Outcome: We won. Workers' compensation was ordered to authorize a trial spinal cord stimulator for our client. Beverly L. vs. Staff Leasing/Liberty Mutual Insurance Co. Outcome: We won. Compensability of the workers’ compensation claim was awarded, as were various medical benefits and compensation checks. Miguel C. vs. Bralew Inc./Diversified Inc/Employers Advocate Ins. Outcome: We won. Having previously secured a psychiatrist for our client, the judge awarded an workers’ compensation attorney fee at the expense of the insurance company. Kelly C. vs. Boran Craig Barber Engle Construction/United Seif insured Services. Outcome: We won. Workers’ compensation checks in excess of $40,000.00 were awarded to the claimant. 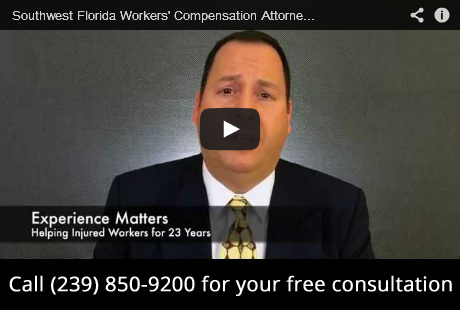 Whether you're looking for a Ft. Myers work comp lawyer or a Naples work comp lawyer, we've got you covered. 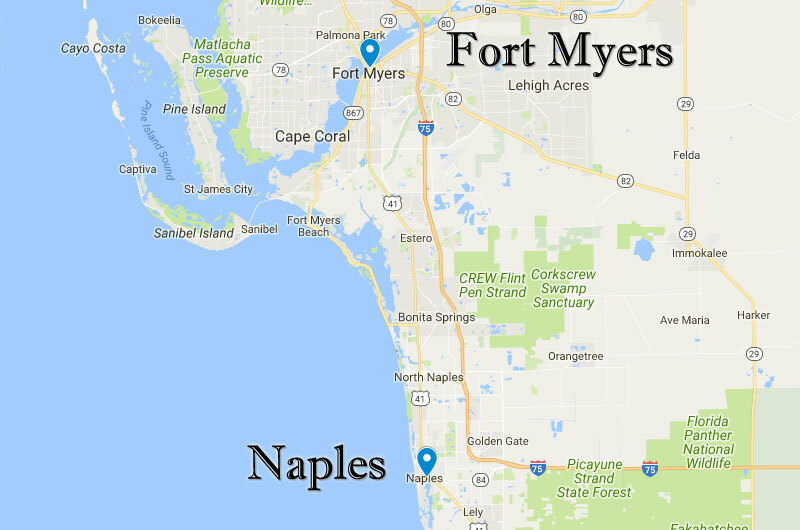 We have offices in both Lee and Collier counties to best serve all of Southwest Florida’s injured workers. Wherever you are, I can help you.